Have you ever wanted to be part of a spy club? 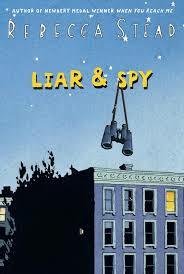 Well, In the book “Liar and Spy”, a novel by Rebecca Stead, bully victim Georges moves into his new Brooklyn apartment, and soon realized that some of the people around him were not who they really seem to be. As Georges and his dad were taking the recycling to the basement, they come across a note hung on the basement door that said “Spy Club Meeting- TODAY!” Georges was curious, so his dad wrote “WHAT TIME?”, under the note. Later on in the day, Georges takes the elevator back downstairs to recycle some flattened cardboard boxes, but when he looks at the sign, the time 1:30 has been written under it. Georges wonders about the meeting when he goes back to his apartment, so he travels back downstairs to attend the meeting. At the meeting, Georges makes two new friends: Candy and Safer. As Safer’s new “assistant spy”, Georges must track down the movements of the mysterious Mr X. who lives in the apartment above Georges. Mr X. is said to wear all black, doesn’t talk, and always carries around a briefcase- full of decapitated heads! Now, with a gum wrapper, a lobby cam, an air vent, and a key, Georges has to unravel the mystery of who Mr. X. really is, and if his new friend is pushing him past the limit. With Safer training him 24/7, and the new “Taste Test” coming up, Georges is going to have to go “all work, and no play”, if he wants to solve the mystery before any more secrets are revealed.